Amazon Tap is an Alexa-enabled portable Bluetooth and Wi-Fi speaker that offers rich, full-range sound. Just tap the microphone button and ask for music, hear the news, search for information, order a pizza, and more with the Alexa Voice Service. Amazon Tap has dual stereo speakers with Dolby processing that provide crisp vocals, extended bass response, and immersive, 360° omni-directional audio. 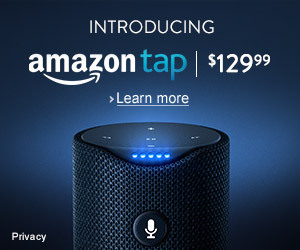 Amazon Tap is available for pre-order today. Learn more about Amazon Tap and see a video at www.amazon.com/amazontap. Visit Associates Central for banners to promote this product.